Do-it-All Counter-top ApplianceWonder Max gives you the stunning five-in-one kitchen advantage. It i..
Cleans, massages, exfoliates, and more! Includes 5 spa attachments: cleansing; gentle exfoliati.. 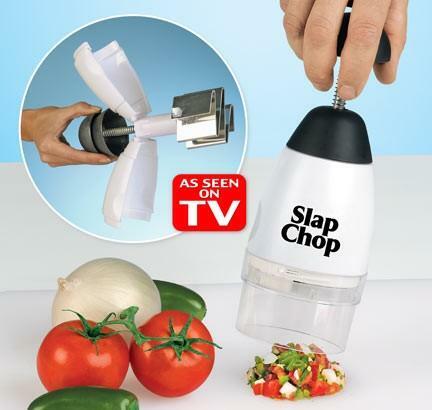 The Slap Chop is a manual chopper machine that works when you slap the plunger part. Each slap triggers the 3 edges beneath to slash and cut the food. The more you slap the Slap Chop, the better the food gets. Hack up potatoes for home fries, or include mushrooms and green peppers for a delectable side to your eggs. Indeed, even utilize the Slap Chop for vegetables like carrots, celery and radishes for a moment plate of mixed greens. Nuts and chocolate are hacked simple for fixings on frozen yogurt. The Slap Chop is incredible for onions and even garlic so your fingers don't smell and it spares time. The Slap Chop's base opens up to uncover the cutting edges for simple cleaning.